FILE - This image made from video posted on a militant social media account affiliated with the Islamic State group, April 11, 2015, purports to show a militant taking a sledgehammer to an Assyrian relief at the site of the ancient Assyrian city of Nimrud, which dates to the 13th century B.C. 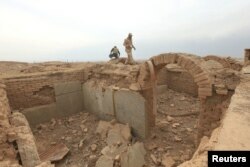 The level of destruction to Nimrud is of such a magnitude that "it is hard to believe that this is recoverable," Sermed Alwan, an Iraqi archaeologist, told VOA. "It is the most important city in Mesopotamian history after Babylon, the capital of the Babylonian civilization," Alwan said. The city has a "special importance to human civilization, for it was the capital of one of the most ancient and powerful empires in human history," he said. And it has "biblical importance, being mentioned as the capital of the Assyrian captivity or Assyrian exile, the period in the history of ancient Israel and Judah during which several thousands of ancient Samarians were resettled as captives by Assyria." 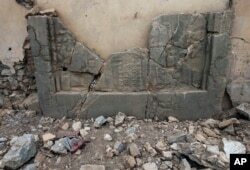 The site stood undisturbed for decades until last year, when IS destroyed it, citing its "un-Islamic" nature. IS released a video in April 2015 showing men blowing up the site; breaking ancient walls with electric drills; and destroying relics, images and other artifacts. Satellite pictures taken by U.S. coalition partners have shown Nimrud's steady destruction since September. The city ziggurat — a tiered temple — has been reduced to a pile of dirt. The destruction also included the library of Ashurbanipal, which is believed to be the world's first library. "There were about 200 ancient panels. [Islamic State] stole some of them and destroyed the rest," Iraqi Major General Dhiya Kadhim al-Saidi told Reuters on a visit to the site Wednesday. The Iraqi operation is part of an offensive to drive IS from Iraq's second-largest city of Mosul and its neighboring areas. Since mid-2014, IS has destroyed dozens of historic sites in Iraq and Syria including mosques, churches and Shi'ite religious halls known as hussainiyas. IS remains in control of some historical landmarks, including the 2,000-year-old desert city of Hatra in Iraq, famed for its pillared Assyrian temple that blended Greco-Roman and eastern architecture. "Iraqi forces fighting IS in Nimrud and other ancient sites that surround Mosul do not have enough knowledge and experience to deal with such an important archaeological site or to keep it safe from vandalizing or further destruction," Alwan said.